Let’s face it – no one does Real McCoy, well-’ard gangster flicks like we Europeans. Of course, Stateside, you can cite Scorsese’s Goodfellas (1990) or Casino (1995) and, at a pinch, Coppolla’s The Godfather (1972) but sorry, when it comes to what violence, fear of violence and callous characterizations are really all about, we have (among many others) Get Carter (1971). We’ve got The Long Good Friday (1980). Frankly, you’ve never really had a glass smashed into your face unless you’ve had it this side of the Atlantic, and there is a gritty, seamy, downright dirty side to the 70s gangster look and feel that only European pubs, bars, clubs and strip-joints can effectively convey. And that’s why we should all be on our knees, to give thanks for Mesrine: L’instinct de mort and the follow-up Mesrine: L’ennemi public n° 1 (released across Europe on 19 November) – both have this dirt in spades. Order has been restored. Jean-François Richet, whose previous film was the somewhat uninspiring remake Assault on Precinct 13 (2005), from John Carpenter’s 1976 original, has simply outdone himself with this balanced, and, in spite of the grim violence at its core, non-hysterical account of what drives a man to devote his entire existence to the crooked path, and the price that must be paid for taking on the system single-handed. Although Vincent Cassel’s previous form might indicate he could play a hot-blooded, moody but intelligently motivate gangster in his sleep, his turn as Mesrine offers a whole lot more than murder and mayhem by the numbers. Helped enormously by the ensemble cast (Gérard Depardieu makes a welcome return to the classic brutish role that first made him famous, Olivier Gourmet is simply wonderful as Commissaire Broussard, Mesrine’s reluctant nemesis on the ‘right’ side of the law), plus a splendidly tight, acerbic screenplay from Abdel Raouf Dafri, which was in turn adapted from Mesrine’s own ‘novel’, written while in jail, Cassel simply IS Mesrine. A peerless master of disguise, Mesrine, whose sworn enemies were the banks, became France’s public enemy numero un during the 1970s, but his road into crime began shortly after his return from France’s war against Algeria in 1959 – aged 23, our man comes back with a clean service record, but quickly finds, despite the best efforts of his loving mother and father (Myriam Boyer and Michel Duchaussoy) the straight and narrow of civvy street too restrictive. Gifted with a quick mind and first-class improvisational skills, Mesrine is also a man of his word, no matter what the cost to himself, as he proves when, upon breaking out of the inhumane Saint-Vincent-de-Paul penitentiary (to which he had been sentenced to 15 years) in 1972, he returns two weeks later to break his jail mates free. There are those who may say that the story is romanticized, as much in love with the man at its centre as Mesrine so clearly was with himself. Pooh-pooh to them – what Richet and Cassel achieve is a near-peerless account of a man who became a myth in his won lifetime, let alone nearly 30 years after his death. Make no mistake – in this film, people die and people bleed. In some ways, none more so than Mesrine himself, who was tortured by his notions of neither being a good son, husband, or father. Put it this way – I know who you will be rooting for from start to finish, and it isn’t any of the representatives of the system that the ‘gangster’s gangster’ swore to bring down. And, to boot, the films are truly thrilling, with Richet proving he is just as adept at the big action scenes as he is with the expository dialogue. 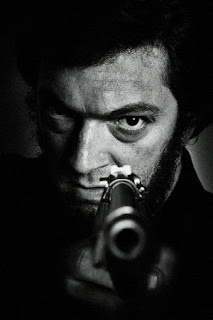 Vive Mesrine! Both films 110 mins. In French. Those are some good examples but I don't think America can give up the "Gangster Crown" so easy. Scarface, original and remake, Bronx Tale, Once Upon A Time in America, Carlito's Way and Gangs Of New York to name a few more. These sound good though, I'll have to check 'em out. Thanks for your comment. Obviously, I was being a touch ironic concerning America's 'gangster crown' - the films you cite are clearly all classics, and there are many others. It's just that it's refreshing to see European gangster flicks playing it straight, without contrived, 'mockney' Guy Richie nonsense, and the Mesrine films certainly do. Hope you enjoy them! But hey! 'Once upon a time in America' is Italian!